We call these superb sandwiches Linda Bagels because my husband's friend and co-worker used to bring them to eat for my husband's birthday every year. In a small bowl mix cream cheese and minced garlic. Slice the avocado in half with a sharp knife. Remove the pit. Using the same knife, make thin lengthwise slices all through the avocado flesh down to the avocado shell. Using a spoon scoop the avocado slices out of the shell and set aside. Separate the bagels and spread 1/4 cream cheese mixture on the bottom slices of the bagels. 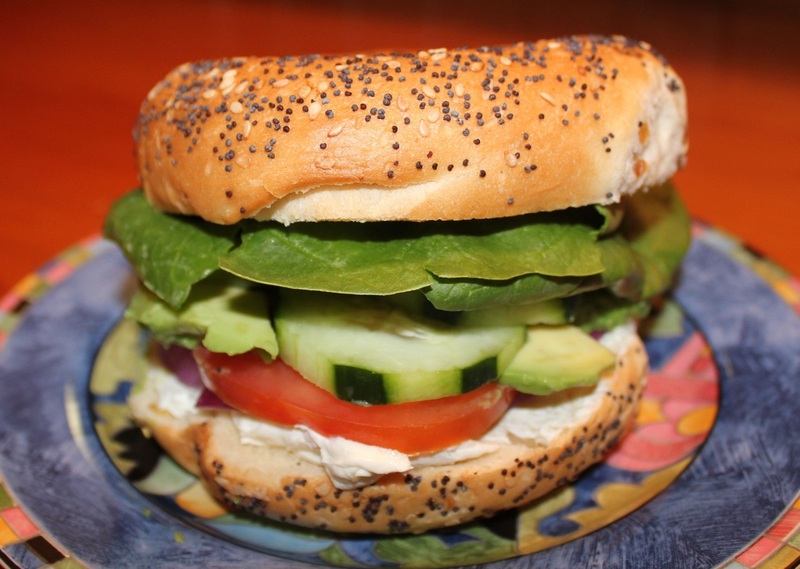 Layer a few purple onion rings, tomato slices, 4 cucumber slices, 1/4 of the avocado slices, the spinach leaves, then top with the bagel half.